Myanmar has recently loosened its visa policy for foreign travelers, especially Southeast Asian countries, interested in visiting this once off-the-radar gem of the region. The thriving tourism opened opportunities and started accommodations that cater budget travelers. Four Rivers B&B is one of the places that provide quality stay in Mandalay at a very affordable cost. Before my visit to Myanmar, I already tried searching for budget places and found out that even dormitory accommodations have a steep rate. 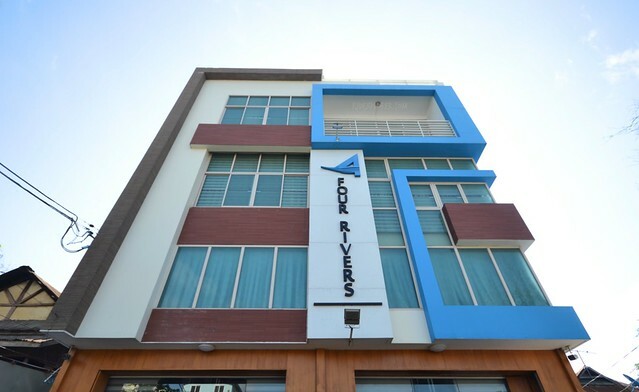 Looking for one that could fit my budget and needs, I decided to book my nights in Mandalay and Yangon at Four Rivers Hostel. If the hostel has locations in Bagan and Inle Lake, I could’ve been booked my entire stay in Myanmar with them. 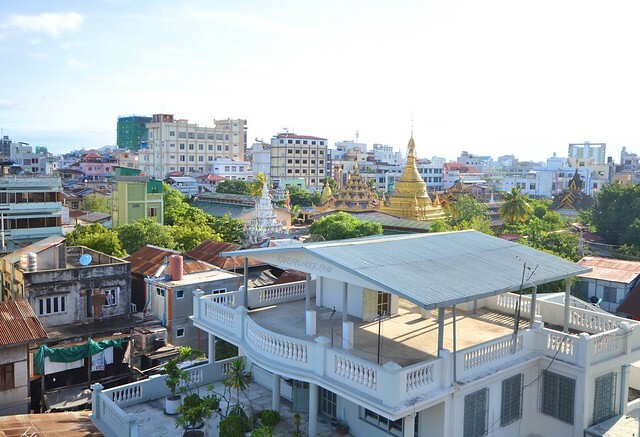 The property is already known to locals and getting to the hostel from Mandalay Airport was a breeze. I found myself being dropped off in front of the accommodation. Bikes and motorbikes were parked in the tiny yard so I assumed they rent those to their guests. The management asks everyone to remove their footwear before entering the hostel lobby. Four Rivers B&B Mandalay rooftop. English-speaking staff welcomed me on my arrival. They allowed me to fill in the similar-to-immigration form and asked for my passport to be photocopied. 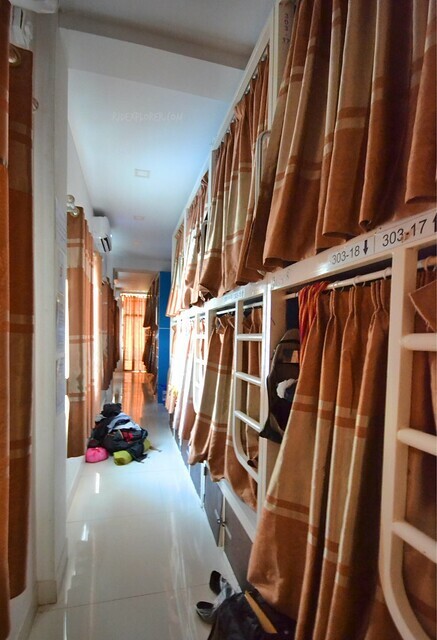 When I settled the MMK5,000 deposit fee and rented a towel for MMK1,000, I was ushered to the dormitory rooms. 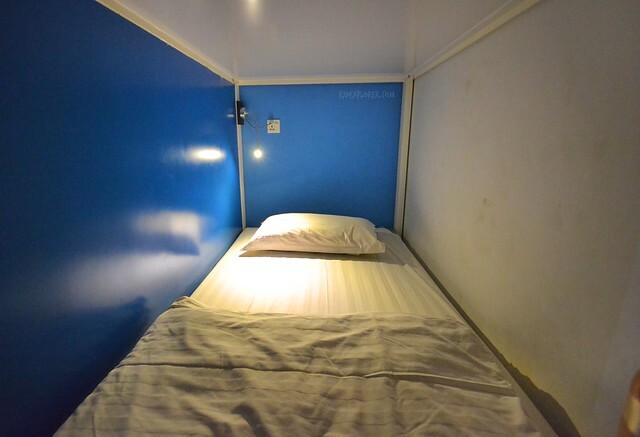 Shared rooms can house up to 20 travelers with their capsule-type bunks. I was lucky to get a lower bed with the lockers within my reach. The lockers have no lock so better to bring one or rent from the friendly staff. The bed has its quality sleeping facilities like soft mattress covered with clean sheets, blanket, and pillow. You also have your own reading light and power outlets. For toilet and shower, there’s a common bathroom on the same floor. Capsule bed in a 20-bed mixed dorm room. 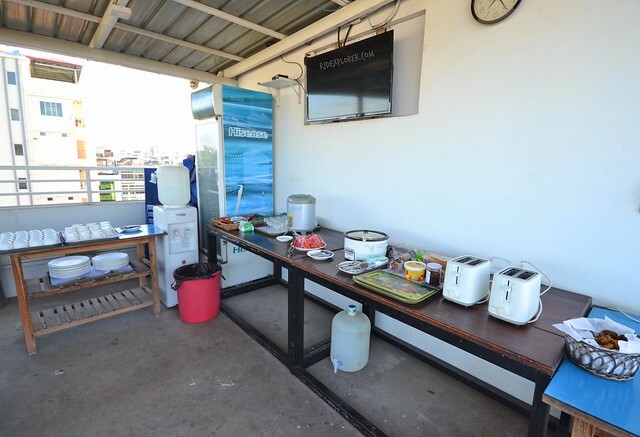 Breakfast included in the rate is served every morning on the rooftop. They try to vary the food every day so guests can enjoy the meal if they’re be staying for few days. 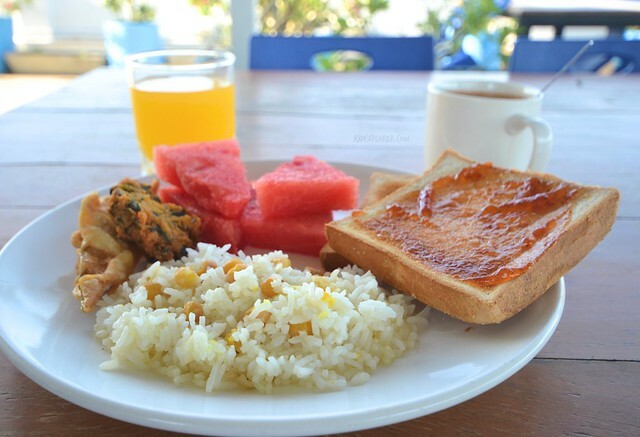 You can have bread and spreads, rice with beans, vegetable fritters, fruits, tea, and juice. Simple breakfast served on the rooftop. The lounge on the ground floor offers ample seats for guests. A flat-screen television is tuned to news or sports channels or depending on whoever has the remote control. 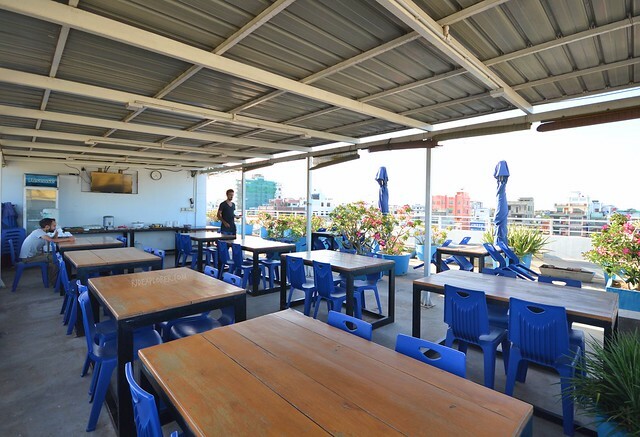 There are few tables where you could munch on Myanmar noodles or food you bought from outside. The hostel has no restaurant so guests are allowed to bring food inside. Plus you get to use some of the kitchen wares but please be mindful to wash it every after use. 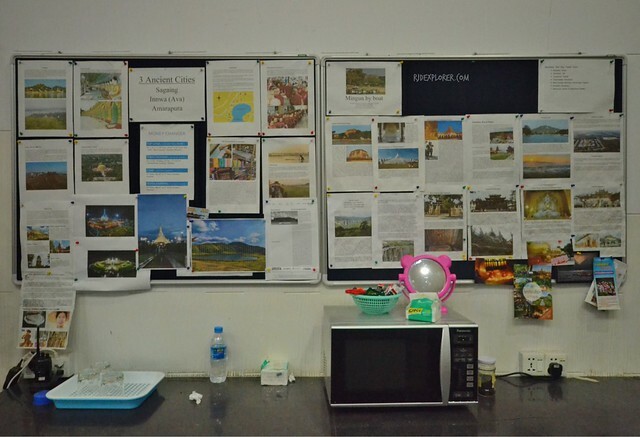 Tourism information at the kitchen. For water, beer, and soda, you can avail from the fridge right next to the reception counter. They also have ice cream of different flavors for only MMK500. Bike and motorbike rentals are available. 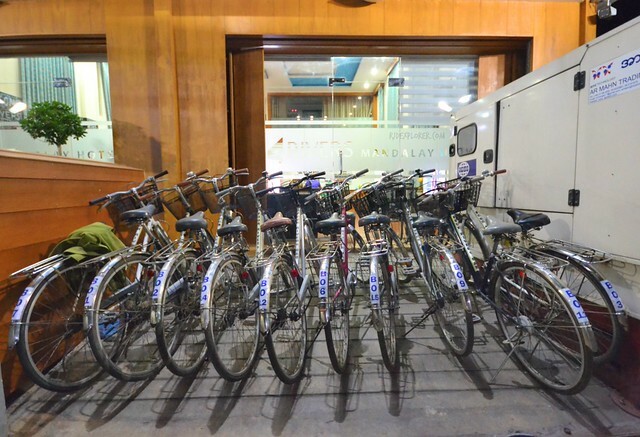 I rented a bicycle for MMK2,000 for a 24-hr rental with the passport as the deposit. Well, you can ask the ladies at the front-desk to have kyats as deposit just in case you’re hesitant to give your passports. On the other hand, motorbikes and scooters are also available for 24-hour rentals. 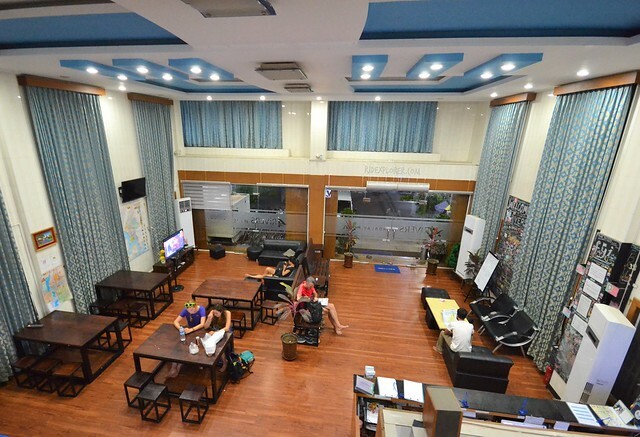 The hostel can also book your bus tickets to any point in Myanmar. I had them book my ticket to Bagan for MMK9,000 that already includes pick-up from the hostel. Other travelers I met at the hostel also had their bus tickets booked by the hostel staff. Some of the tickets already include pick-up from Four Rivers B&B while for some, you need to show up to the terminal. If you’re afraid of biking around Mandalay but need to go somewhere, they can call for a motorbike taxi for you. Though their contact gives a higher price than the other drivers. Neighborhood and view from the hostel’s rooftop. Staying at Four Rivers B&B Mandalay was very straightforward; rooms are clean, facilities are basic but nice, and the staff is very friendly and helpful with travelers needs. Socializing is a bit of a challenge but the management tries to offer day tours to some sites in the region where you get to bond with other travelers. Had a fun day tour to the ancient cities with new found friends from China, US, and Netherlands.